We are such stuff as dreams are made on’, the Bard memorably wrote in The Tempest. With the collaboration of the School of English and the Department of Italian of the University of Leeds, Gianfranco Cabiddu presents his award-winning movie The Stuff of Dreams, the story of a small acting company stranded together with a group of Camorra members on Asinara, a former jail-island north-west to Sardinia. In a magisterial blend of reality and fantasy, the heterogeneous group of castaways attempts to prove their innocence by performing, with little preparation, in William Shakespeare’s The Tempest, delivered in the folk version written by Italian dramatist Eduardo de Filippo. The film screening of the UK premiere of La stoffa dei sogni/The Stuff of Dreams (2016, 103 min, Italy) by Gianfranco Cabiddu took place on Tuesday 7th November at 8pm at Vue Cinema, The Light (Leeds). The screening was followed by a Q&A session with the film's director. Gianfranco Cabiddu was in conversation with Gigliola Sulis (Italian@Leeds, University of Leeds) and Martin Butler (School of English, University of Leeds). Translation was provided by Alessio Maria Mattana (School of English). This event was part of the Leeds International Film Festival. La stoffa dei sogni won important awards including the 2017 David di Donatello and the 2017 Globi d’Oro. Watch: the video of Cabiddu's Q&A. On a wonderful island occupied by a prison for more than 100 years a group of actors, coming from different parts and delved into an out-of-the-world landscape, create an immortal text where Shakespeare and Eduardo cooperate. Like any castway of any storm they are also willing to overcome difficulties thanks to the carelessness of art. That’s the Italian art of getting by, the ability to adapt in order to survive, which can recreate magic, carelessness, imagination and poetry in theatre and in life with just few elements. This film makes you laugh and move at the same time and it leaves a good taste in your mouth when leaving the cinema. On Wednesday 8th November at 11am, the University of Leeds hosted a seminar and Q&A session with the director Gianfranco Cabiddu. These events were coordinated by Italian@Leeds, the School of English and LivItaly, in association with Leeds International Film Festival and Sardegna Film Commission. Imagine an island in the Mediterranean Sea, off the north coast of Sardinia. Nothing but the sound of birdsong and the crashing of waves fill the air. The sun beats down on the rocky shore and time seems to stand still. This is the island of Asinara and the setting for Gianfranco Cabbidu’s most recent film La stoffa dei sogni (The Stuff of Dreams), which had its UK premiere at the Leeds International Film Festival on 7thNovember 2017. 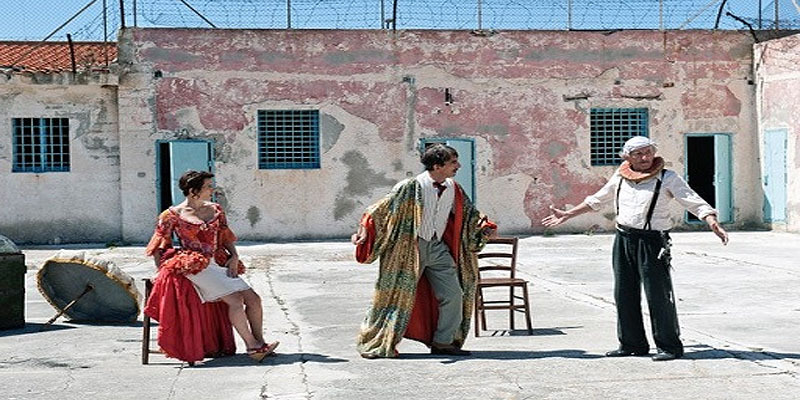 Shipwrecked on a prison island off the coast of Sardinia, a group of inmates and a small theatre company have to work together to convince the prison governor that they are innocent and should be set free. Confused about whether or not to believe them, the governor sets the challenge of staging Shakespeare’s Tempest from which he will decide who the real actors are and who belongs in his jail. This is the premise of the story which was written by the director, alongside Ugo Chiti and Salvatore De Mola. The film screening was accompanied by a series of Q&A sessions with the director himself, hosted by subject experts, and organised by LivItaly in collaboration with the University of Leeds School of English and Department of Italian. These seminars attracted people from all disciplines: students, film buffs, researchers and the general public all enjoyed a deeper insight into the inspiration behind this rendering of Shakespeare’s final play. Gianfranco Cabbidu started off his career in the ‘Arts’ under the great Italian dramatist Eduardo de Filippo, who translated The Tempest into Neapolitan dialect opening it up to a new audience that the high-register Italian version had neglected. Later Cabbidu would move into the film industry, working as a sound engineer where he learnt the trade. He made his debut as a director with the feature filmDisamistade in 1988. 30 years had passed since the director of La stoffa dei sogni finished working with Eduardo de Filippo, and he found himself on the island of Asinara –previously a prison island, but now a national park- and was struck by its uncanny resemblance to the location described by Shakespeare. It was this that inspired Cabbidu to pay homage to his old master by creating a film that would combine the Neapolitan version of the Tempest with all the humour of L’arte della commedia – another of De Filippo’s works. The film is rich with literary, political, and cinematic allusions. The cinematography is smooth and the script is well written, so it is unsurprising that it was awarded various prizes; including the 2017 Italian Golden Globe for best film. However, the film is by no means elitist or overly highbrow. As Gianfranco explained in one of the Q&A sessions following the screening: he wanted to continue the same sentiment that his old teacher and friend had worked on; to make the film accessible and enjoyable for everyone, and he has achieved this brilliantly. The plot is genuinely funny, the visual is breath-taking, and the acting is remarkable. As part of Leeds International Film Festival, ‘La stoffa dei sogni’ (the stuff of dreams), directed by Gianfranco Cabiddu, was screened on 7th November in the Light. Gianfranco also generously gave up some of his time to do a Q+A where he revealed some behind the scenes tales and discussed his inspiration for the film, which facilitated some lively debates. ‘La stoffa dei sogni’ was very well received and the Q+A was both interesting and insightful. The film portrays Gianfranco’s unique take on the Shakespearean play ‘the Tempest’and uses the structure of a play-within-a-play (or in this case, a ‘play-within-a-film’). In this way, the film employs humour and fantastical elements, as well as dealing with the more political and moral aspects such as the prison and its inmates. The film takes places on the beautiful island of Asinara, located off the north-western tip of Sardinia. From the First World War, up until 1997 this island was used as a high security prison camp, and is portrayed as this in the film. This immediately establishes a paradox in the film; it is set outside in nature, which usually symbolises freedom, however, in this film the island, with its dramatic landscape and the clear blue water surrounding it, is restrictive and imprisoning. The majority of the main characters experience almost no liberty at all, but instead fight for their freedom and to prove their innocence through the highly unusual circumstance of performing a play: ‘the Tempest’ (as requested by the governor of the island). For the 11 weeks of shooting, the island virtually became a ‘prison’ for the cast and crew, as this remote island had no restaurants, hotels, or even phone access. Gianfranco admitted that for the first week of filming this was a difficult adjustment, however, they quickly adapted and enjoyed working with such a beautiful landscape. ‘La stoffa dei sogni’ contains numerous references to other Shakespearean works, such as ‘Hamlet’ and ‘A Midsummer Night’s Dream’. In the Q+A, Gianfranco brought up the fact that many young people today perhaps find Shakespearean plays heavy and unappealing. His intention in this film was to make Shakespeare’s ‘the Tempest’ more accessible, whilst still paying homage to this great work. In the film, one of the prisoners (disguised as an actor) argues with the theatre manager that the script of ‘the Tempest’ should be changed into more accessible language in order for the criminals to be able to act in their roles more convincingly and avoid imprisonment. However, the theatre manager contends that it is debauchery to change such a respected work as one of Shakespeare’s plays. This point of contention is particularly interesting and relevant as it brings to light the continual debates as to whether Shakespeare’s language is perhaps too inaccessible for his works to be taught comprehensively in schools and universities. It was interesting to see how the initial Italian translation of ‘the Tempest’ used language which was equally as inaccessible as the English. Continuing the theme of language, another point of interest which arose in the Q+A was the variety of Italian language spoken in the film. The actors spoke Sardinian, Neapolitan, neo-standard Italian, literary Italian and so on. These differences, which most non-native Italians are unfamiliar with, unless they have either studied or are familiar with Italian linguistics, are difficult to recognise and understand in the context of this film. Therefore, it is questionable as to whether, to a certain extent, the film can be fully understood and appreciated by non-native Italians. One suggestion in the Q+A was to adjust the subtitles, to indicate when the language changes. However, Gianfranco pointed out that this might overcomplicate the film and would be difficult to do in a way which didn’t distract the audience member. Although no conclusion was drawn, it was interesting to hear different points of view as to how to tackle this particular aspect, which is also relevant for many other Italian films. All in all, it was fascinating to hear what Gianfranco could tell us about the behind-the-scenes of filming, writing the script, and also his 30 years of experience in the film industry. I feel fortunate that I was able to attend both the screening of the film and the Q+A session and would thoroughly recommend ‘La stoffa dei sogni’ to both Italian and English speakers. It was enlightening and inspiring to hear from such an esteemed director and I look forward to attending future LivItaly events. Recently, I, along with many other students studying Italian here at the University of Leeds, went to the UK premiere of La stoffa dei sogni (The stuff of dreams) by the celebrated Italian director Gianfranco Cabiddu. The idea for this film was first conceived when Cabiddu was just 22 years old, whilst he was working as a sound technician for Eduardo De Filippo – one of the great theatrical minds of the 20thcentury in Italy, who at the time was translating the original Shakespearean text of The Tempest in to ancient Neapolitan. We then fast forward nearly thirty years, to when Cabiddu started filming a few scenes of the original Tempest, which he enjoyed so much that he decided to make a feature film adaptation – along with the help of the great Eduardo De Filippo’s son. Cabiddu then visited Asinara – a small island of the north coast of Sardinia – which has recently become a national park; before that it was a prison island for some 130 years. Upon arrival, Gianfranco recounts how he immediately had the sensation of being on the island in Shakespeare’s Tempest, and it easy to understand why. The setting of Asinara seems the perfect choice after watching this film; its beautiful, almost ethereal landscape provides an idyllic backdrop to this cinematographic work of art. Suffice to say, there are many comedic moments whilst the group haphazardly tries to pull together this show convincingly in the short time frame. I also found it interesting that on a deeper level, La stoffa dei sogni deals with several challenging themes. For instance, the forbidden love between the governor’s daughter (Miranda) and Ferdinando (one of the members of the Camorra) runs as a parallel sub-plot within the film; the star-crossed lovers in The Tempest are also called Miranda and Ferdinando. Cabiddu uses these same names not merely for convenience or comic effect, but to show the viewer that life truly does imitate art. It is of no surprise to me that this film garnered the critical acclaim that it did. With a superb cast, an engaging plot and shot it an outstanding location, Cabiddu’s latest masterpiece really is the stuff of dreams. For the last couple of weeks, our city has played host to the Leeds International Film Festival. Hundreds of film screenings have taken place in every nook and cranny of the city, from the Hyde Park Picture House, to Trinity’s Everyman Cinema. On Tuesday 7th of November, the Vue Cinema in The Light hosted the UK premier of Gianfranco Cabiddu’s ‘La Stoffa dei Sogni’ (The Stuff of Dreams), followed by a Q&A session with the director himself. The film is a beautiful Mediterranean interpretation of Shakespeare’s The Tempest, and takes place on a prison island just north of Sardinia. [...] This enthralling mixture of deception, dreams and reality echo many of the well-known traits of this famous Shakespearean play, whilst also keeping the film’s contents relevant to modern audiences. Gianfranco Cabiddu is also known for his movies ‘Faber in Sardegna’ and ‘Il Figlio di Bakunin’, as well as a crime TV series ‘Disegno di Sangue’. He spent part of his career as an assistant to Italian arts legend Eduardo de Filippo. His interest in The Tempest started when he began work on creating a Neapolitan translation of the script with de Filippo. As a tribute to his late maestro, Gianfranco Cabiddu has added a new dimension to this already well-loved tale, incorporating his homeland, Sardinia. The island seen in the film is Asinara, once a prison island itself, but today home to a national park. In the seminar hosted by the University of Leeds prior to the screening, the film’s director (Gianfranco Cabiddu) revealed why he chose this particular island. He said that upon visiting it he just knew that this was the island from ‘The tempest’. As the film shows, this mesmerising Sardinian island shows not only nature’s beauty, but also its ability to isolate and destroy. ‘La stoffa dei sogni’explores beautifully the idea of man’s imposition on nature, as well as the linguistic issues that are still existent in modern Italy. ‘La Stoffa Dei Sogni’ won the David di Donatello award this year for Best Adapted script, as well as the Globo d’Oro for Best Film. The film festival continues until 16th of November, so be sure to catch one of these events around the city!